Linen suits flutter in the breeze, large quantities of ouzo are consumed, and an Oedipal triangle plays out against Greek ruins in The Two Faces Of January, Hossein Amini’s tony take on one of Patricia Highsmith’s lesser novels. As a screenwriter, Amini (Jude, Wings Of The Dove, Drive) has long specialized in literary adaptations and Freudian undertones; here, the former is partly subsumed by the latter. 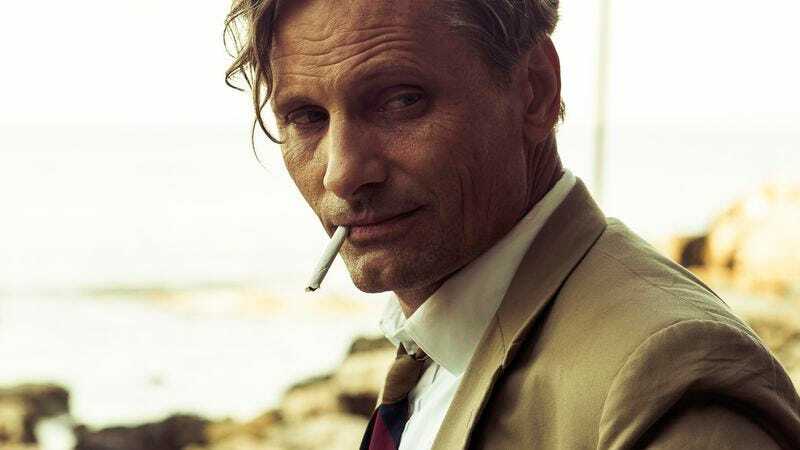 Set in 1962, the film stars Viggo Mortensen as Chester MacFarland, a middle-aged American businessman who is vacationing in Greece with his much-younger wife, Colette (Kirsten Dunst), on money bilked from Stateside investors. Chester accidentally kills the PI who’s been sent to trail them, leading him and Colette to go on the lam, with their expat tour guide, Rydal (Oscar Isaac), as an accomplice. Chester reminds Rydal of his late, estranged, overbearing father, and the younger man makes little effort to conceal his attraction to Colette. At first, Chester—who isn’t half as composed or charming as he believes himself to be—thinks of Rydal as a mark, a lost twentysomething who needs a father figure and will follow a beautiful woman anywhere. Then, he begins to suspect that Rydal’s weaknesses are, in fact, dangerous; given enough time, he will destroy Chester and usurp his place. By the time the two men pass through an airport checkpoint pretending to be father and son, their fates are long past being sealed. Highsmith’s work slithers along by exposing and exploiting vulnerabilities; her worldview is misanthropic, and her characters are relatable because she jabs their anxieties, compromises, and weaknesses so hard that a reader can feel it. The Two Faces Of January preserves this essential quality, with underplayer extraordinaire Mortensen doing predictably fine work as Chester; his buzzy, reedy voice and signature half-grin suggests worldliness and vulnerability in equal measures. The other points of the triangle don’t fare as well. Rydal becomes more and more of a single-minded obstacle as the movie goes on, and Amini’s version of Colette is sketchy; her only motivation seems to be fulfilling her part in this tragedy. From the midpoint on, the movie’s preordained ending hangs like a thick cloud over the characters; eventually, it becomes hard to see anything but the inevitabilities and parallels. January skirts by on its tastefulness and appreciation for the source material, however single-minded. It’s a movie of small pleasures: slow-burn suspense; period flavor, with an emphasis on the era’s textures, clothes, and luggage; an effective score by Pedro Almodovar’s regular composer, Alberto Iglesias, which is built around a variation on Arvo Pärt’s “Fratres”; a basic respect for the viewer’s intelligence. The Two Faces Of January may not be trying anything bold, original, or especially complicated, but what it does, it does well.